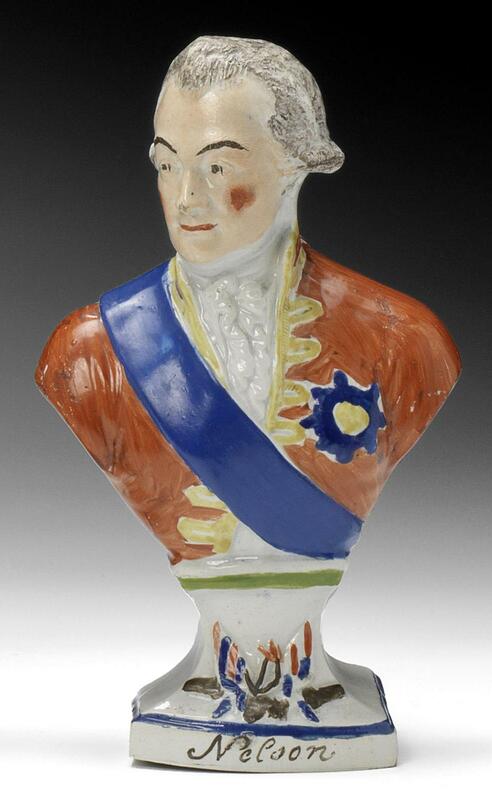 So popular was Admiral Nelson – in England, at least – that all manner of souvenirs and toys[i] were produced to commemorate his Naval victories and ultimately, his death. 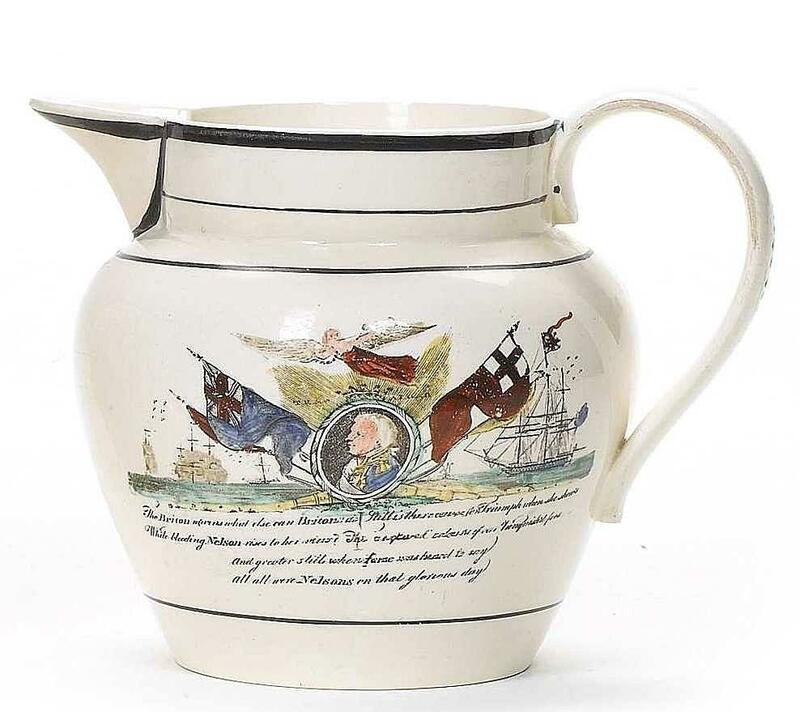 The Staffordshire potteries churned out fairings, jugs, mugs and tea wares with rousing slogans and effigies of Nelson (figs. 1 & 2). Meanwhile the Birmingham toymakers set their presses to work stamping out brass handles. The brass drawer knob in figure 3 has a stamped face, spun onto a cast body. 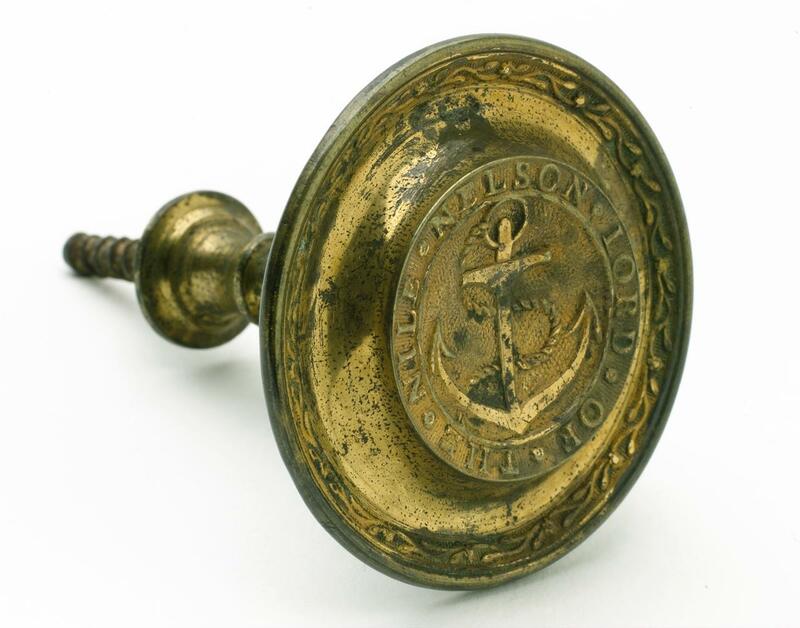 The legend reads “NELSON • LORD • OF • THE • NILE” and would have been produced following Nelson’s victory at the Battle of the Nile in August 1798. Fig. 3. Stamped and cast brass drawer knob, circa 1800. 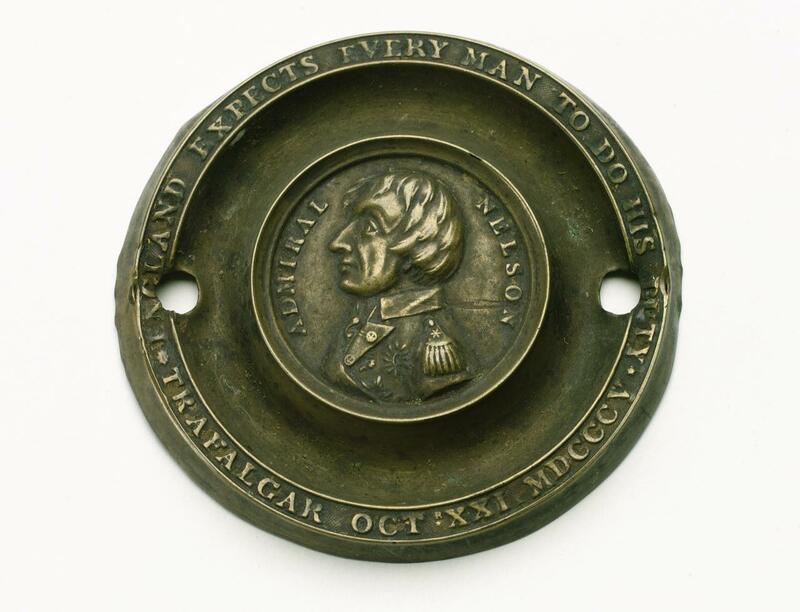 At 11:45 on October the 21st, 1805, off Cape Trafalgar, Nelson engaged the French and Spanish navies, famously signalling to his fleet: “England expects that every man will do his duty.” The brass backplate in figure 4 portrays Admiral Nelson in a central roundel within the legend “ENGLAND EXPECTS EVERY MAN TO DO HIS DUTY • TRAFALGAR OCT: XXI MDCCCV”. Fig. 4. 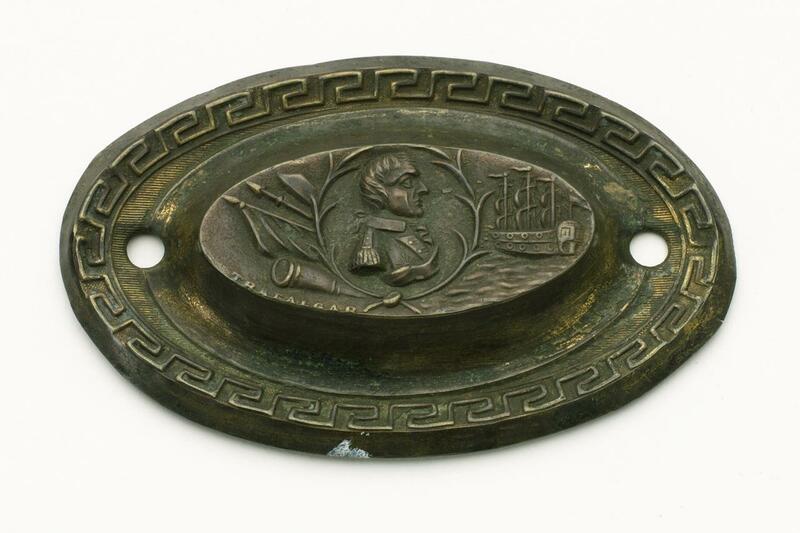 ‘Admiral Nelson’ brass backplate, circa 1805. Fig. 6. 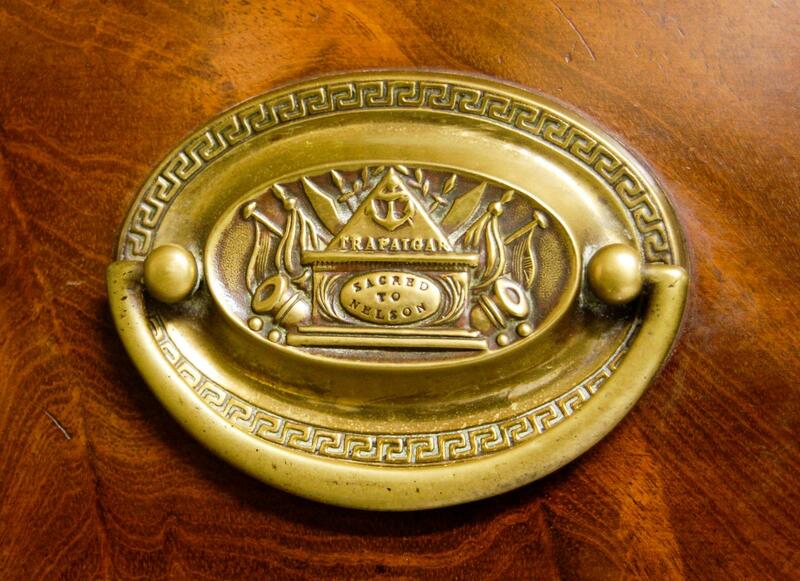 ‘TRAFALGAR’ brass backplate, circa 1805. 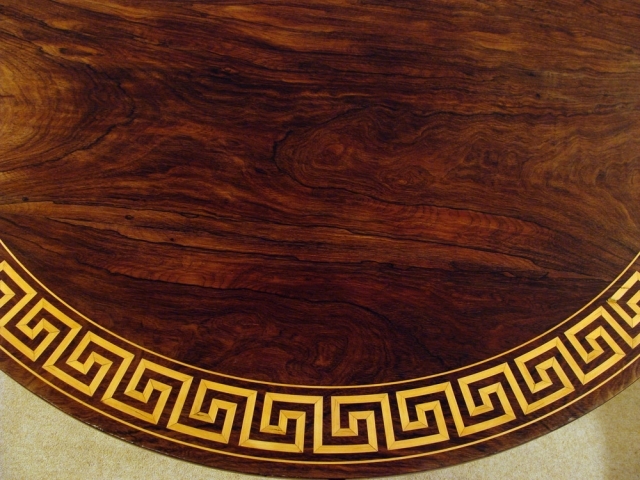 The Greek key border around the backplates in figures 5 & 6 is also seen in furniture of the late eighteenth- and early nineteenth-centuries, either as inlay (fig. 7), or in the friezes of chest-on-chest and bookcase entablatures (fig. 8). [i] ‘Toy’ was a contemporary name for small personal and domestic metalwares such as buckles, buttons, commemorative medals, corkscrews, furniture handles and fittings, toasting forks, watch cases and in the nineteenth-century, pressed metal novelties and playthings for children. This entry was posted in Antiques, Cabinet Fittings, Picture This and tagged Admiral Nelson, backplate, Battle of the Nile, brass handles, Greek key, pearlware, souvenirs, Staffordshire potteries, toymakers, toys, Trafalgar. Bookmark the permalink. No, the French (or the Danish, for that matter) weren’t so keen on him! Lovely handles, do you know if anyone is making reproductions? I’m not aware of any reproduction Nelson handles, but I’m sure Renotte would welcome your enquiry. 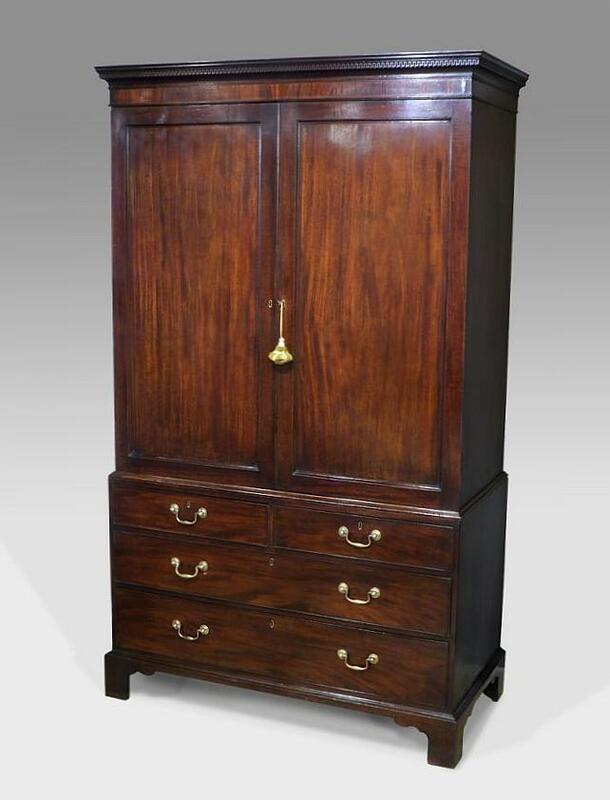 Lovely linen press but which came first, the armoire or the linen press? Just wondering who inspired whom. Armoires are French and linen cupboards are English. Armoires are the French equivalent of the British clothes press, but being French, the armoire is somewhat outside my area of expertise. I can’t really say which came first. Either way, clothes presses and linen presses are by far the more handsome!